The unique prison program diverts 685 tons of food waste a year into compost and is training inmates to farm without chemicals. The butternut squash has outdone itself on this two-year-old organic farm in Northeast Philadelphia. Hundreds of the winter squashes—753 to be exact—are stacked up high in the bed of a gold pickup, but many more await harvesting. Three workers crouch in the green rows surrounded by peach and figs trees, as well as beds that have already in their short lifespans borne eggplant, watermelons, and more. One by one, the workers toss more squash into wheelbarrows. This small and unusual farm was once a construction site. Its three acres back onto the Pennypack Creek, a winding tributary that empties about a half mile away in the Delaware River. Overlooking the orchard’s entrance is the Philadelphia Industrial Correctional Center, a red brick building surrounded by two layers of barbed wire fencing and light towers. This is a prison farm, and the workers in the rows are inmates from another nearby minimum security facility. Sustainability has not been a high priority in most prison systems. But in 2011, the National Institute of Corrections began encouraging “the greening of correctional facilities” through actions on energy consumption, waste, and re-use, and offering incarcerated people green job training. The Washington State Department of Corrections was an early leader on all these fronts with its Sustainability in Prisons Project and, now, sustainability is becoming a reality in Philadelphia, too. These institutions, which didn’t even recycle a decade ago, now boast a state-of-the-art composting system, a farm, and an organic agriculture vocational program through which inmates earn certificates from Temple University. The benefits are already beginning to show. The office of Philadelphia Mayor Jim Kenney noted recently that the program diverts 685 tons of food waste a year into compost, saving the city more than $40,000 in landfill costs. The Environmental Protection Agency (EPA) recognized the Philadelphia Prison System in this year’s national Food Recovery Challenge awards. In September, Kenney awarded the prison department’s sustainability manager Laura Cassidy a prestigious innovation award for her efforts in creating “Philadelphia’s first City-run captive food waste composting program.” And while nothing about this success was inevitable—Cassidy and other have worked to make it happen—it is replicable. Cassidy, a slim woman with jet black hair, steers her Mini Cooper to the composting facility at the old Holmesburg Prison. Less than a mile away from the main prison complex, Holmesburg closed in 1995 and is used now for prison overflow and, occasionally, as a film location. In 2012, Philadelphia Prison System (PPS) built aerated compost bays outside the crumbling building and established a permanent worksite for inmates. Nobody in the prison’s department knew much about composting then. Sustainability wasn’t Cassidy’s expertise. Ten years ago, the prison’s department hired her as an analyst, “a number-cruncher,” she says. But, in 2007, former mayor, Michael Nutter, was elected to the city’s top office with a mission to make Philadelphia the greenest city in America. Since Cassidy had some knowledge of sanitation from working in the Streets Department, her new boss put her in charge of implementing their first single-stream recycling program. “We went from zero to approximately 300 tons of recyclables a year,” Cassidy says. But she thought they could do better. “If we do single-stream recycling properly, what’s left is food waste,” she points out. When she learned that inmates in the PPS generate 1.4 pounds of food waste per person per day, she realized that the prisons could divert their food waste as well, saving money from landfill costs in the process. But there aren’t any commercial compost facilities in the region so the prison would have to build its own, a pricey endeavor. The only way the prisons could afford to do that was through grants. “I hunted the EPA down,” Cassidy says, netting $15,000 from the EPA for the pilot phase and, three years later, another $60,000 from the city’s Office of Sustainability to expand the program to waste from a second facility. When Cassidy arrives at the Holmesburg site, Officer Rick Orange and four inmates wearing orange step out of a trailer. The trailer is both Orange’s office and a classroom for those pursuing the organic agriculture certificate. Orange has been here since the beginning, when PPS created a new post to oversee the inmates working in composting. He didn’t know much about composting at the time, but now he’s a pro. On weekdays at around 6 a.m., Orange hauls dozens of 22-gallon barrels to the prison’s main campus, where he picks up inmates from the low-security Alternative and Special Detention facility. 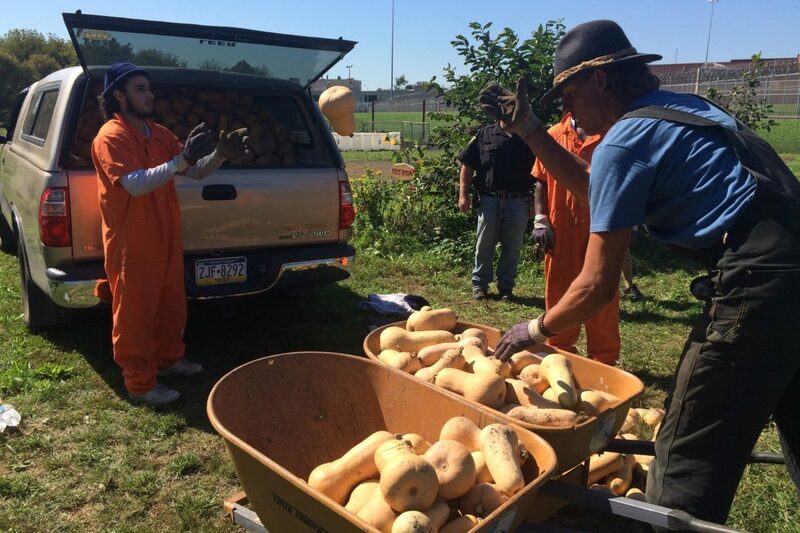 Together they load one ton of food waste from two of the prison’s six facilities and bring it back to the Holmesburg site to store (covered with wood chips) in bays that are aerated with PVC pipes below. The waste sits in the bays for 60 days before the work crew moves it out to the adjacent field for another month. After the compost dries, they filter out contaminants with a washing machine barrel drilled with hundreds of holes. There were problems at first, Orange says. New to composting, he and his team struggled to get the compost up to 132 degrees for three days, the amount of time needed to kill all the pathogens. But now he knows if something is wrong by sight and smell, he says, and so do the men who work with him. “If it smells like earth and dirt, they know it’s done,” he says. One ton of food waste coming in per day from about 2,000 inmates adds up to a pretty serious supply of compost—far more than the prison system could use on its own. Orange says they initially used it to fertilize flower beds around campus, but quickly found a simple solution by giving the compost away to community gardens throughout the city. The pH levels of the Holmesburg composting operation are exactly on target, Orange says, and it’s free. So there’s an understandably high demand. “I usually can’t keep up [with it],” he says. Cassidy grabs a fistful and lets it run through her fingers. “It’s black gold,” she says. Back inside the trailer, the four inmates have just finished polishing the floors and cleaning the card tables pushed into one big oblong shape. They’re getting the room ready for the new class starting later that week. Abijah Hines will be in that class, he’s hoping a little farm-to-table knowledge will bolster his dream of opening a Caribbean restaurant. “Who would think that I’m a correctional officer and I have chickens?” says Officer Paul McCann, gesturing a fenced-in square in the orchard where two roosters and 18 hens peck at cracked watermelons next to a Dumpster-turned-coop. We’re standing amid rows of apple, paw paws, figs, jujube, and peach trees (they were planted in 2014, so most are still too young to bear fruit), where McCann, who has been a correctional officer for 22 years, supervises the inmates/students. Like the composting program, the prison orchard was inspired by Mayor Nutter’s plan to make Philadelphia green. But this time, the idea came directly from the mayor’s office. In 2014, Nutter’s office secured donations of nearly 200 fruit trees from the local conservancy and dedicated this tract of land as the official Philadelphia Prison Orchard Project. Cassidy says the city initially considered the orchard a goodwill project, but it quickly became clear that it could undergird the sustainability initiatives already underway at PPS by providing fresh fruit and vegetables for use in its Aramark-run cafeterias. She notes the company seems receptive to using produce from the orchard in prison meals, but there needs to be a dedicated and predictable volume of produce available first. The city is not permitted to sell the produce since the orchards are tended by workers who are getting paid far below the minimum wage, so right now it lands mostly in the back of Cassidy’s car, where she gives it out to co-workers and food pantries. “Never in a million years did I think I’d have an orchard,” Cassidy says. But it made sense to place it under her purview. And not only could her office arrange to use the compost to fertilize the orchard, but connecting the composting system and the orchard would also help provide an improved form of job training for those who would soon be reentering the community. Whereas composting is menial job, organic farming benefits the workers, too. So PPS partnered with Temple University to offer a vocational certificate to any inmates who completed the program. Earning even that small recognition from a reputed four-year university could give these men a leg up with potential employers. “When a guy already has 10 strikes against his name on the job market, anything will help,” Cassidy says. Sebastian Kretschmer, a local organic farmer and adjunct professor at Temple who had been consulting with the prisons department in designing the orchard, came on board to to lead the 10-week organic agriculture course. Inmates alternate weeks working at the composting facility and the orchard under his guidance, and on Fridays they meet in the trailer’s classroom to learn about the science and strategies behind it all. The men collecting hundreds upon hundreds of butternut squash graduated from the organic agriculture program this past May, but have been working on the orchard for a little more than a year. Amed Conde has passed his minimum sentence date, but he’s still months away from his maximum release date, meaning he might be released from prison at any time if a judge deems fit, and every day is an anxiety-fueled waiting game. Some of the men working alongside Conde think of the orchard merely as a Zen garden to escape that anxiety. But Conde wants to use the experience to find work on the outside. Conde immigrated from Guinea more than 20 years ago, started an import/export business, and became a leader in the Guinean expat community before he was caught up in a financial fraud conspiracy case. At age 47, Conde didn’t know anything about farming when he arrived, but he signed up for the orchard project because he liked being outside and he liked learning. Now, he wants to start an urban farm when he’s finally released. “I wasn’t happy [to come to prison], but I got something good out of this,” he says. It’s a surprisingly idyllic environment for a job in prison. “They really have taken ownership of this stuff,” Cassidy says of the workers at the orchard. They worry about the chickens when foxes come around and they care for the trees and gardens. Conde points out another benefit of working in the orchard is that Cassidy and McCann treat him like a human. “Every day I can’t wait to come back here because it’s like freedom,” Conde says. Most prison systems are still in the early stages of developing sustainability programs, but it’s likely those programs will grow quickly. Shawn Garvin, regional administrator for the EPA, says it’s normal to see the kind of momentum that took Philadelphia prisons from recycling to urban farming in less than a decade. Those actions can snowball to inspire other agencies and institutions. “And so the PSS becomes one of those shining examples of what you really can do with food waste,” Garvin says. The city of Philadelphia itself is looking to the example of its prison system as it expands its sustainability goals. Christine Knapp, director of the Office of Sustainability, says the city’s waste diversion rates have hit a plateau in recent years. The prison compost program nudges those rates and shows the rest of the city that more can truly be done. “Food is the next frontier for diversion,” she says. For Cassidy, the point of all this is simple: she wants to see the inmates learn and leave—and hopefully never come back. Glad to see a newfound concern for sustainability in the prison sector, but frankly any labor of this kind of unacceptable if these prisoners are not being paid a legal wage. In the case of supplying fruits and vegetables to the dining hall, this would automatically create an incentive for Aramark to support incarceration because they would get free produce. The certification is a nice perk, but just like unpaid internships, this is work that can and should be done by a paid individual. The Georgia Department of Corrections was very forward-thinking as far back as the mid 1990's when they established a prison food waste composting program. As a consultant, I was part of a team that set up composting and recycling operations at Georgia state prisons that served 39 prisons and communities across the state. The programs have composted as much as 4,900+ tons of food waste and diverted almost 24,000 total tons of materials in a single year. We estimated that thru recycling revenues and diversion cost savings, the programs could be valued at close to $1m.